FACT CHECK: Did Donald Trump Register 'Make America Great Again' in 2012? 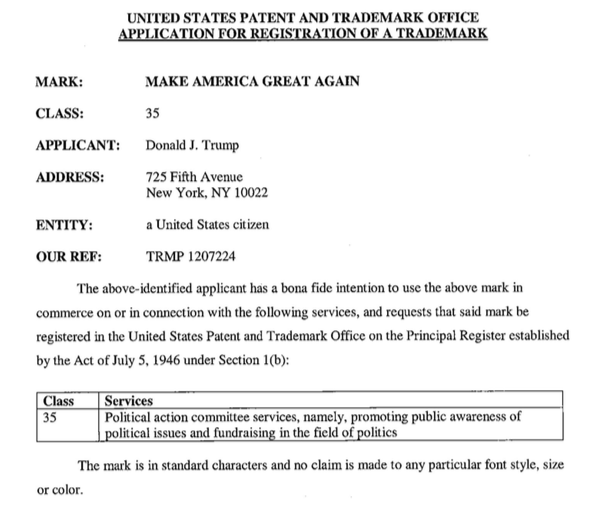 Donald Trump filed a trademark application for his campaign slogan in November 2012, despite claims that he had no plans to run for office at the time. Donald Trump registered his "Make America Great Again" slogan in November 2012. That move came under scrutiny in 2018 as Trump, now president, defended himself against allegations that a Russian influence campaign helped him get elected in 2016. The initial application, which registered the trademark for use in “political action committee services, namely, promoting public awareness of political issues and fundraising in the field of politics,” did not explicitly state that the slogan would be used for a presidential run. Donald Trump later transferred the registration to Donald J. Trump for President, Inc. 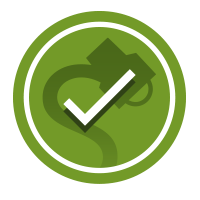 The application became publicly available October 2013, when it was first published for public review—all trademark applications undergo both internal and public review. The U.S. Patent and Trademark Office approved the trademark’s registration on 14 July 2015. Trump has flirted with a political career a number of times prior to his 2016 run. He tossed the idea around in 1987, and again when he ran for the Reform Party nomination in 2000. He publicly toyed with the idea of running for the 2012 GOP nomination before officially deciding against it in May 2011. Michael Cohen, a Trump Organization executive and a current personal attorney to Donald Trump, registered the website shouldtrumprun.com even earlier, sometime in 2010. The New Yorker. 16 February 2018. The New York Times. 2 September 1987.